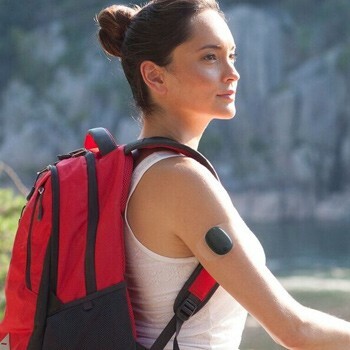 Senseonics’ Eversense XL continuous glucose monitoring (CGM) system, featuring an implanted sensor with extended life of up to 180 days, has been approved in Europe. This decision doubles the previously-approved 90-day wear time, meaning that the sensor can be used more than 12 times longer than any other CGM sensor available in Europe. Senseonics plans to launch Eversense XL in Europe later this year. In the US, the 90-day version remains under FDA review, with a possible approval later this year or in early 2018. Like the 90-day Eversense CGM system, the 180-day Eversense XL features a small sensor (~5/8 inches long and ~1/8 inch in diameter; slightly larger than a pill) that is implanted in the upper arm. The 5-10 minute procedure can be carried out in a typical doctor’s office. It requires only local anesthesia and involves a small incision about one-quarter inch (5 to 8 mm) long. The user then wears a rechargeable transmitter device on the skin directly above the implanted sensor. The transmitter, which can be taken off and put back on at any time, powers the sensor and sends real-time glucose readings and trends to a smartphone. Both the smartphone and on-body transmitter can alert the user of high or low glucose levels. When the phone is out of range, the on-body transmitter itself can provide a vibration alert – a cool feature that also distinguishes Eversense from other CGMs. Eversense still requires two fingerstick calibrations per day and is not approved for insulin dosing or as a replacement for fingersticks (like Dexcom’s G5 or Abbott’s FreeStyle Libre). Thus far, Senseonics has slowly rolled out Eversense in Europe, and we’ll be interested to see if the launch broadens and this new 180-day CGM option gains traction. Interestingly, approximately 80% of those who have gone on Eversense in Europe previously wore CGM.